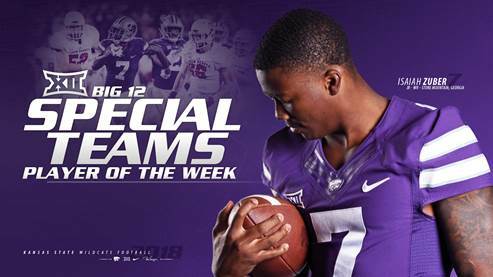 MANHATTAN, Kan. – With an 85 yard punt-return touchdown that changed the momentum of the game in addition to a 10 yard game-winning touchdown reception, Kansas State junior Isaiah Zuber was named Big 12 Special Teams Player of the Week, the conference office announced Monday. It was Zuber’s first-career player of the week honor and the 49th by a Wildcat since 2011 to rank second the Big 12. Of those, K-State has a conference-best 27 of the special teams variety. With K-State trailing South Dakota, 24-12, early in the fourth quarter, Zuber energized the team and the crowd with an 85-yard punt return touchdown on the attempt of his career to cut the deficit to five. It was the 10th-longest punt return in K-State history and the longest since Tramaine Thompson went 89 yards for a score against Missouri State in the 2012 season opener. The score was the 48th by the Wildcat via either a kickoff or punt return since 2005 and the 112th non-offensive touchdown since 1999, both of which lead the nation. Five minutes later, Zuber hauled in a 10-yard pass from Skylar Thompson in the back of the end zone to give the Wildcats the lead. After grabbing a touchdown reception in 2016 at Stanford and last year against Central Arkansas, Zuber became the first Wildcat in school history with a touchdown catch in three-straight season openers. Kansas State hosts Mississippi State on Saturday in an 11 a.m., game that will be televised nationally on ESPN and serves as both Harley Day and a Stripe Out. A Wildcat 4-Pack is on sale for $99, while view level group tickets are just $20 each when purchasing 20 or more. Tickets can be purchased online at www.k-statesports.com/tickets, by phone at 1-800-221-CATS or at the main ticket office inside Bramlage Coliseum.